The owner of a pet sheep shot dead with a rifle has said he is planning to put his farm on the market. 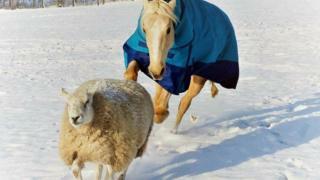 The sheep was "effectively executed" at the farm in Colton, near Rugeley, on Thursday, the RSPCA said. The farm has been targeted on other occasions, including one in which a horse was slashed and whipped more than 40 times. Trevor Street, the sheep's owner, said: "We want to put the land up for sale. We don't want to be here anymore." He added: "The animals come first. Their safety is our main priority." The RSPCA said it was liaising with police over the attack on the sheep, which had been hand-reared from birth and named Shaun. Mr Street said he believed that the attack was the action of "someone with a grudge". RSPCA inspector Natalie Perehovsky said the owners were "understandably, very worried that they're being targeted deliberately".